This is the blog of Donna Salazar, a wife, mom, artist, designer, teacher and kid at heart. 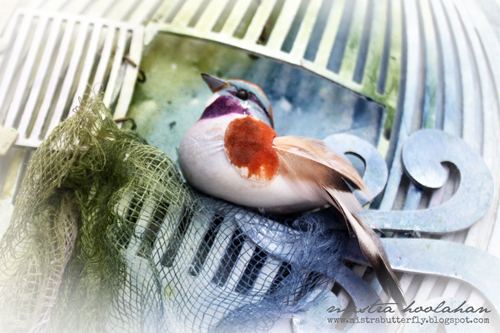 My playful nature tends to come across in my products and classes because I believe that art should be fun. I am known for blending contrasting elements to create what I call my “Girlie Grunge” look. My style is especially appealing to mixed media artists, however my love of flowers and all things sparkly seems to appeal to crafters of all types and styles. 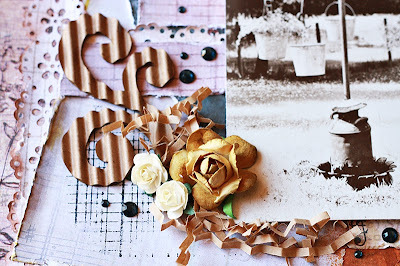 You’ll find lots of inspiration, tutorials and giveaways on my blog. 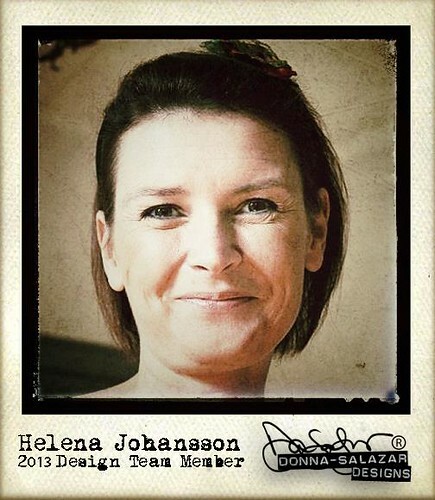 And not just from me... but from my entire design team as well. Its a load of inky-painty-glitzy-grungy fun!!! Hello my peeps! We have moved the official DSD blog over to blogger. We will keep this blog open but there won't be any new posts after today. You can find our new beautimus blog HERE. Welcome Back!! It's me again!! I am back to show you a quick how to on making a weathered door from chipboard. 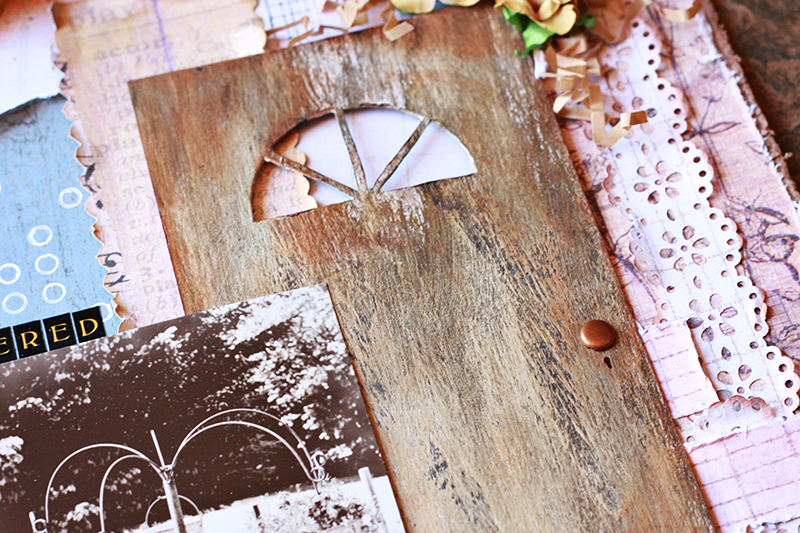 Here is the layout I made using one of the doors I created. 1) Thin Piece of Chipboard Cut to about 7.5"x4"
To start your door you need to create the window for it. I just cut out a pizza shape and traced it four times to create my window. 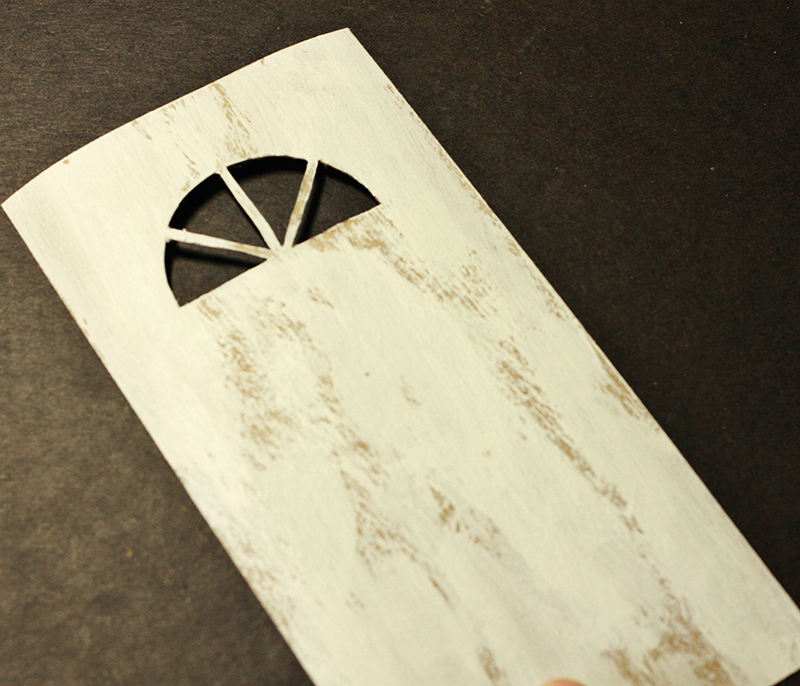 Next use a cutting tool to cut out the window and then lightly coat your door with gesso. 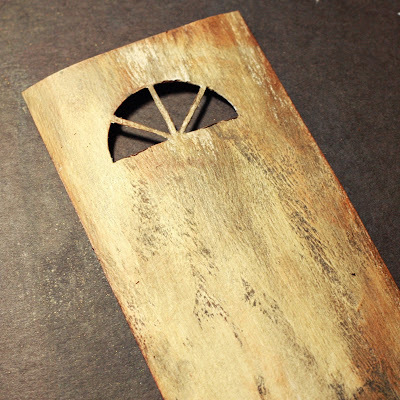 Next spray the Wood Stain spritz here and there and then wipe with a paper towel. Repeat using the Caramel Latte spritz. 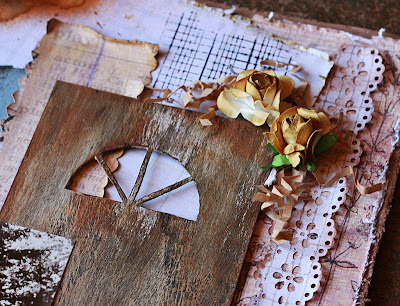 Then go over the edges and very lightly on the front with Chox Inx in Driftwood. A door knob is optional and it depends on how you are layering your door. Sometimes you might not see the handle, but for my layout I did make a door knob using a brad and then drew on a keyhole below it. Thanks for stopping by! Below you will find a list of products that I used for this layout! 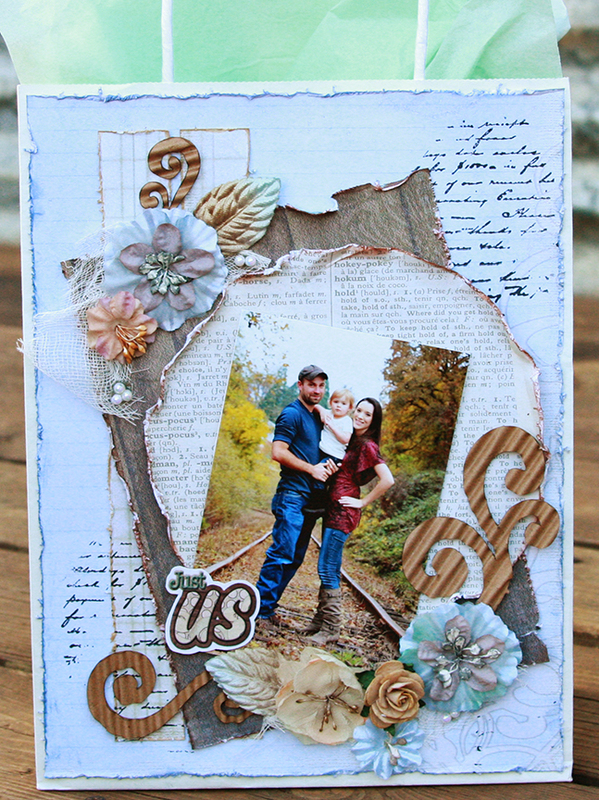 It's Tracey here to share my second July Guest Designer project. 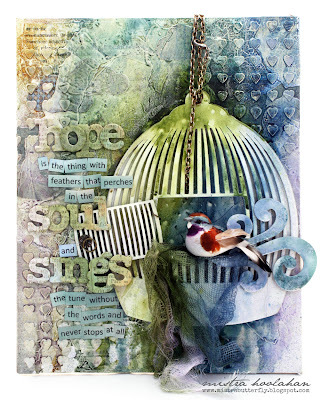 I enjoy getting inky and inventive with Donna's amazing products. I had so much fun coming up with some new techniques to share with you today including a tutorial for my Grungy Corrugated Leaves. Andrew and his groomsmen posed for this shot looking quite serious and dare I say intimidating? 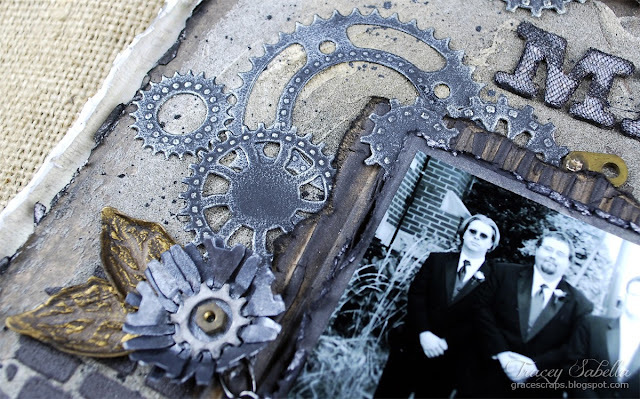 To capture that feel, I decided to go dark and grungy with this non-traditional wedding layout. One of the things I so appreciate about Donna's paper is the versatility within each collection. The papers featured on this page are from her GCD Natural Beauty Collection, the same collection used for "The Kiss", a sweeter and more elegant page posted here earlier this month. 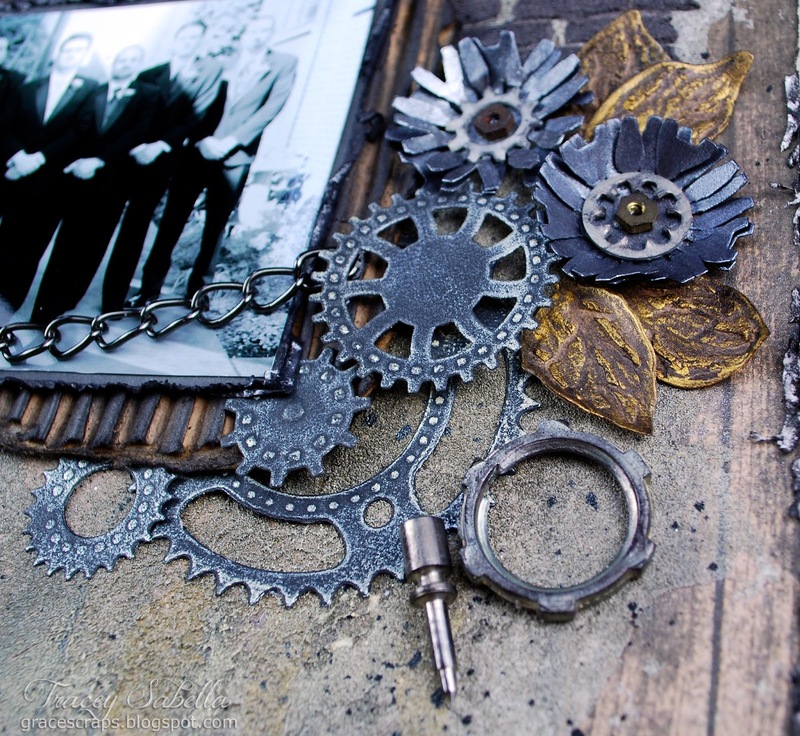 I would like to dedicate this page to the memory of Earl Hennis, who's vintage gears and machined pieces are tucked in among the Sprightly Sprockets. I used Donna's Sprightly Sprockets die set by Spellbinders to create these realistic metallic gears using black cardstock and Viva Inka Gold. I made lots to tuck in all around this page. If you have guys in your life, these dies are a must have. Here's a close-up of the other side of the photo. 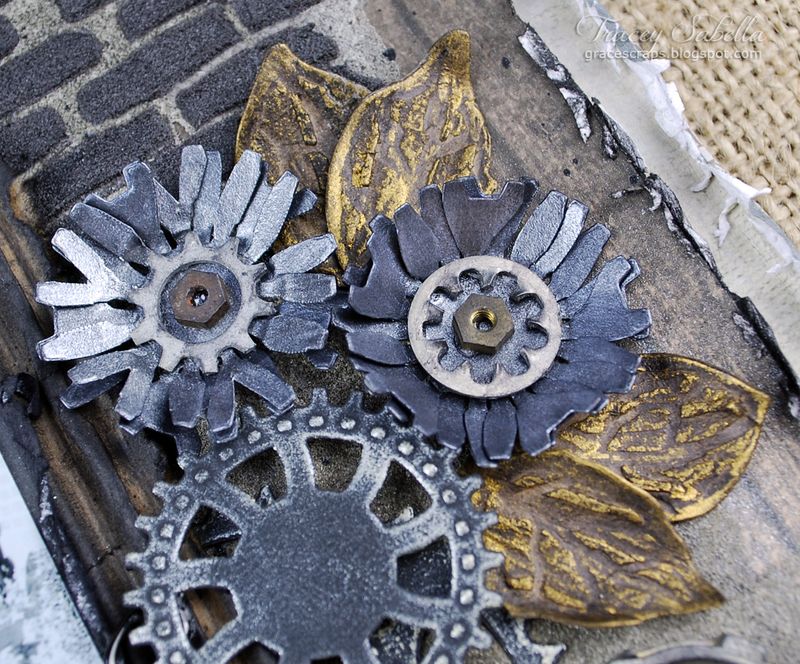 Now for these grungy guy flowers. Can you guess what dies I used to cut these flowers? 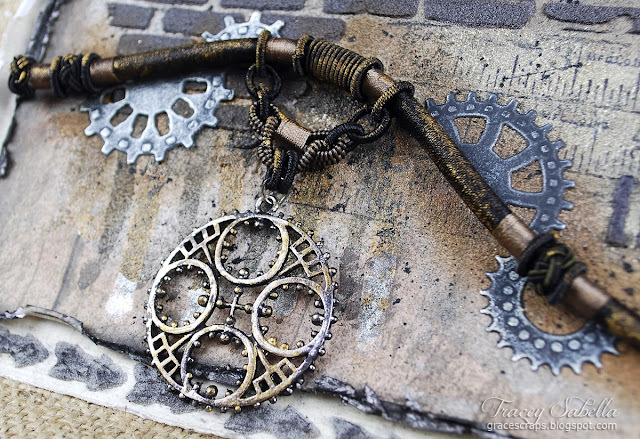 If you picked Sprightly Sprockets, you are correct! I placed a vintage gear and hex nut in each for my flower centers. 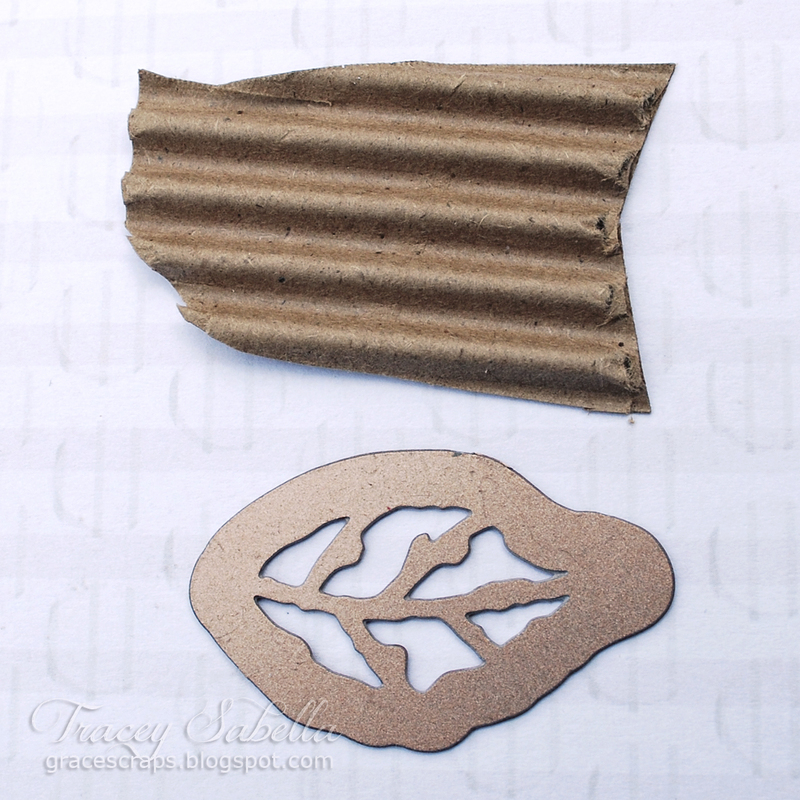 Scroll down to find my tutorial for the Grungy Corrugated Leaves. 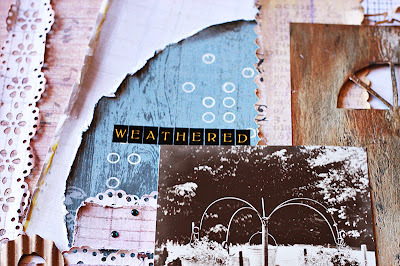 I used mixed media and Donna's Want2Scrap Stencils to build a grungy background on this wonderful wood grain paper. 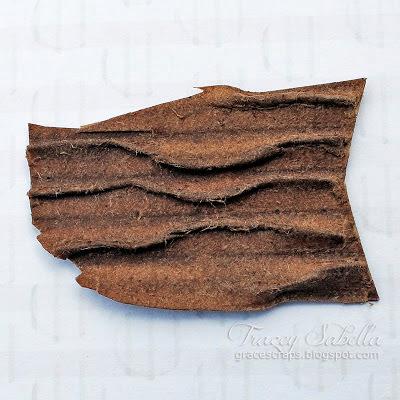 I started by spreading ceramic stucco across the page leaving the edges clear to see the gorgeous wood grain on the edges. I then misted with Donna's Clearsnap Smooch Spritz in Wood Stain and touches of Pralines and Cream. Once dry, I splattered with black gesso. I mixed black and red paint into more of the ceramic stucco and used it with Donna's 8" x 10" Small Bricks stencil. Such a perfect accent to reflect the bricks behind the guys in the photo. 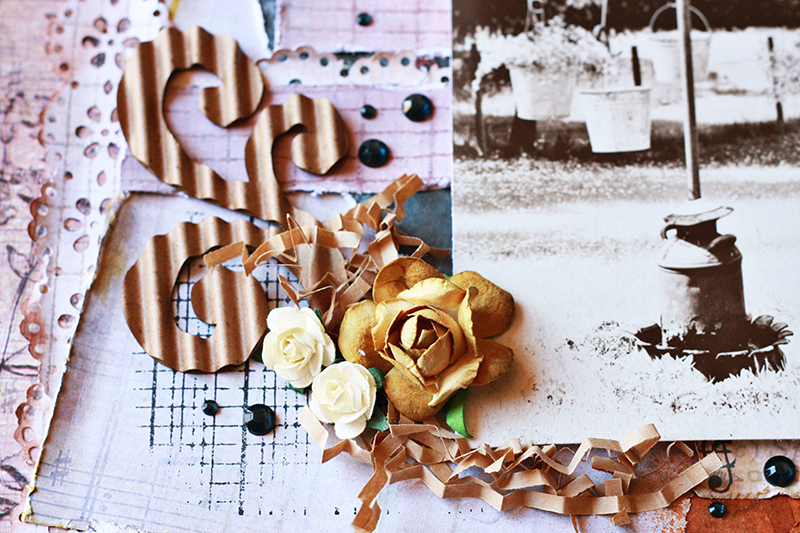 Oh did I have fun grunging up Donna's GCD Studio's Natural Beauty Chipboard Alpha letters for my title. I used my heat tool to melt black tulle onto the letters and inked the edges with Midnight Mix'd Media CHOX Inx by Clearsnap. I used Donna's Want2Scrap Alphabet Stencil and blended fiber medium to create the smaller letters. Another of her Want2Scrap stencils, Small Arrows, was used along the top and bottom of the page with ceramic stucco. I rubbed on just a bit of Midnight CHOX Inx to add grungy texture to the arrows. 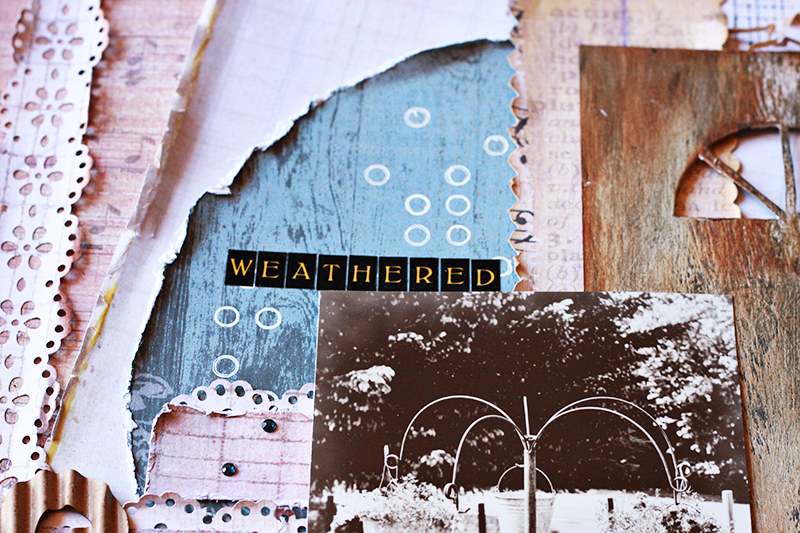 The distressed edges were achieved with my go to DSD Zutter Distrezz-It-All. This charm and wrapped cord are jewelry findings from my stash. I dabbed them with Midnight CHOX Inx and Grecian Gold Rub'n Buff to distress. Behind the cord, I rubbed Sparrow CHOX Inx into the background and behind the charm, dripped Donna's Wood Stain and Pralines and Cream Smooch. I have to say, Donna's Corrugated Board is one of my favorite products. 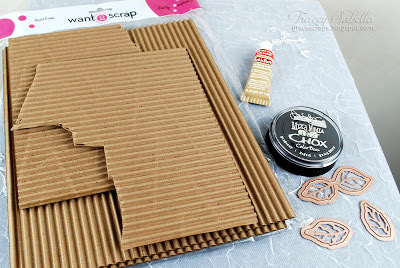 What a treat not to spend time peeling the top off of cardboard, and it can be used for so many embellishments. Step 1. 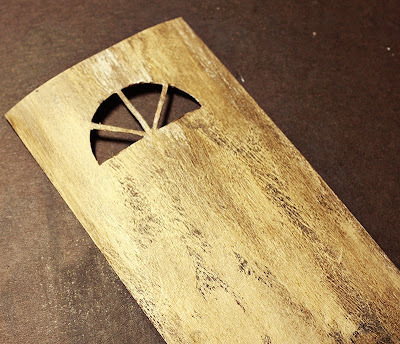 Cut a piece of corrugated board to size for your leaf die with the lines running the length of the leaf. Step 2. Mist the piece of corrugated board with water front and back. 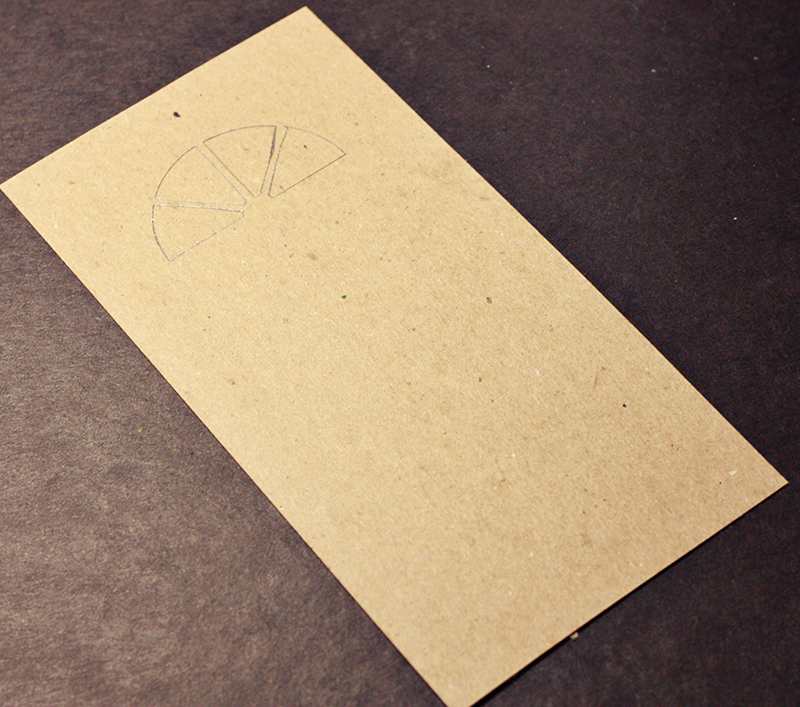 Push on the dampened cardboard to scrunch and distress. Step 3. 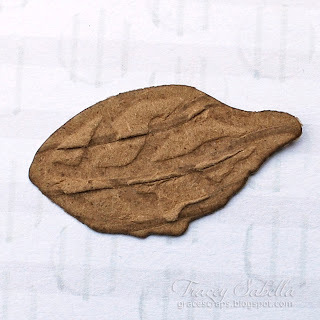 Use a Bitty Blossoms leaf die and your die cutting machine to cut out your leaf. You may need to run the die through your die cutting machine several times to cut cleanly through the corrugated board. Remove from die and set aside to dry. Although I only show one leaf here in the tutorial, I used all four leaf dies from this set to cut leaves for my page. You could also use leaf dies from Donna's Grand Peony or Rose Creations die sets. Step 4. 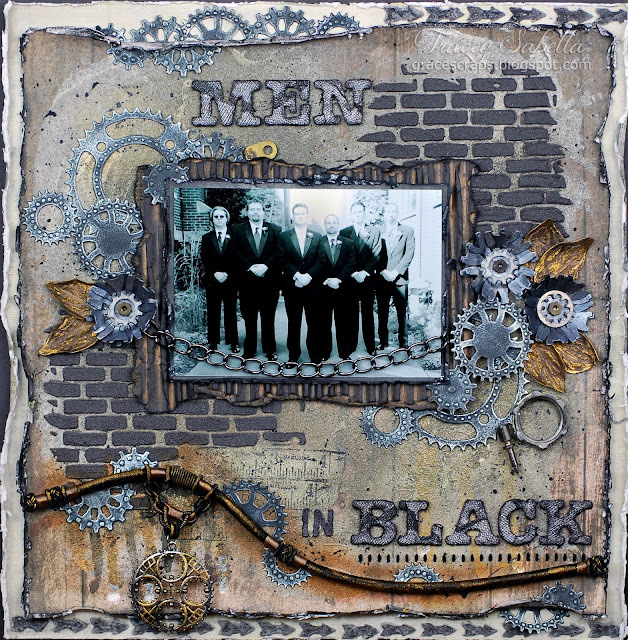 Rub with Midnight CHOX Inx, leaving some of the corrugated board color showing. Set aside to dry. Step 5. 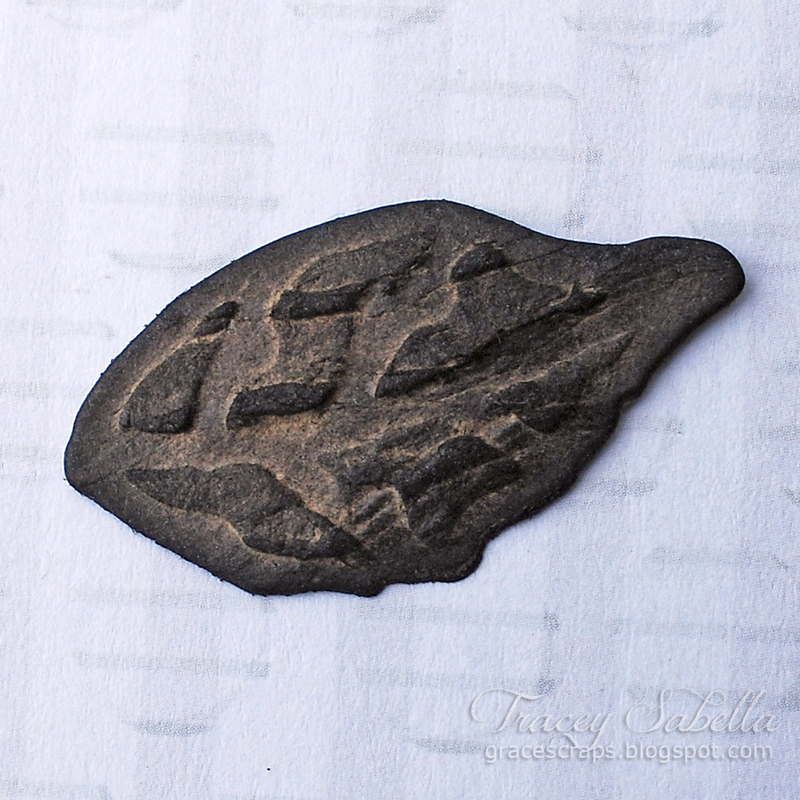 Using a light touch, rub Grecian Gold Rub'n Buff onto the raised areas of your leaf. 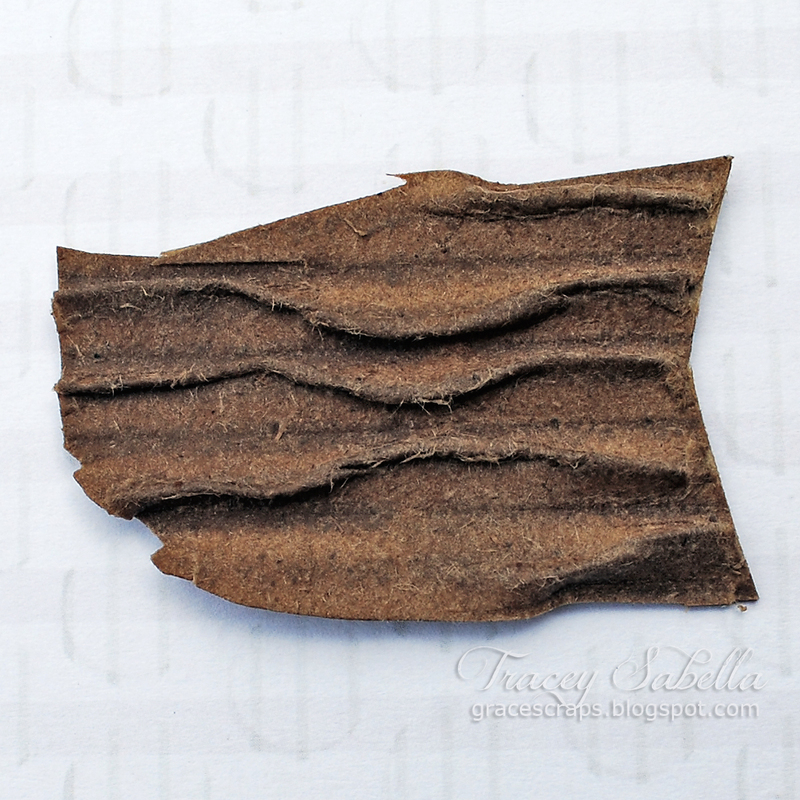 Now your Grungy Corrugated Leaf is ready to use on your page. You can curl the edges or leave flat. 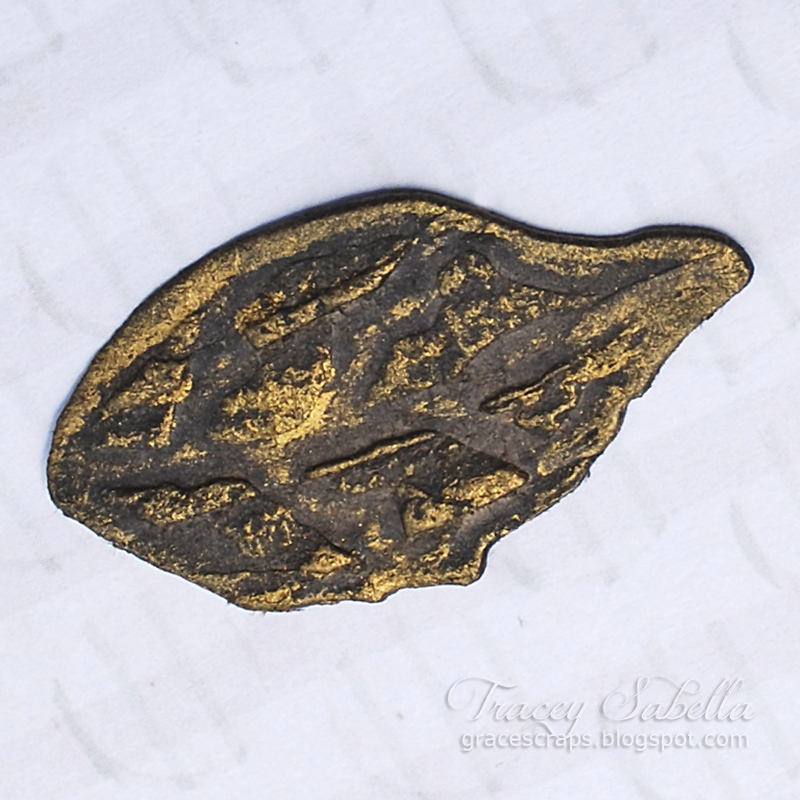 Instead of inking with black, I used Jasmine Mix'd Media Inx for the leaves I created for "The Kiss", then rubbed Pewter Inx onto the raised edges. 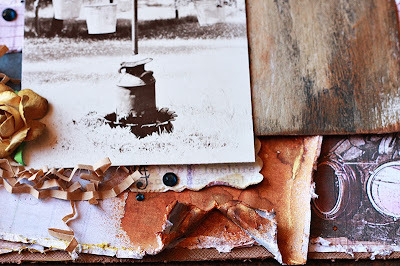 You could use any combination of colors to create lovely, grungy leaves for your projects. 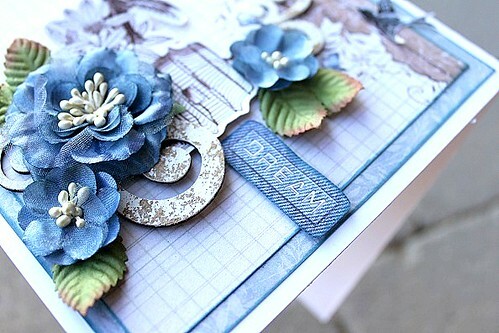 Thanks for dropping by today to view my layout and tutorial. I hope you'll stop by later this month for my final July GDT project. Hello my peeps! Sorry that this post is going up late. I uploaded the video yesterday and in case you haven't seen it you can view it HERE. This week I'm in AZ with my mom and sister playing with ICE RESIN®. 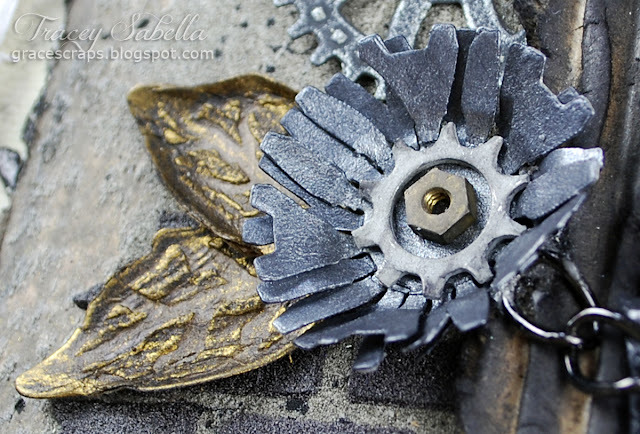 I show you several projects that I've made we coat a hair flower with resin and I show you how easy it is to mix this product. But... the fun part is at the end... almost half of this week's video is bloopers. E-mail natasha@donnasalazar.com with your mailing address and she will send out your prize. Hi everybody! Here is a card I made using GCD Studios and Donnas beautiful Family Jeans line. I have used papers from the 6x6 paper pad and just inked the edges a bit with Mix'd Media Inx, color Patina. 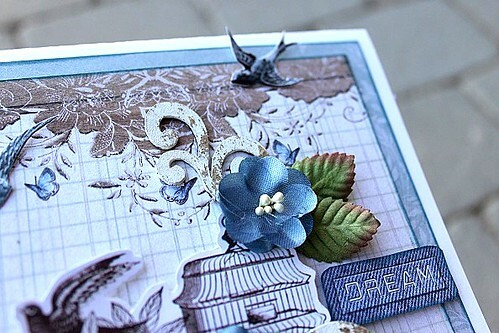 The birds and birdcage are cut from the 12x12 pad image sheet from the Natural Beauty collection. Hi Everybody!! It's Mandy!! Everybody knows that when summer comes around, so do weddings and this year I have two in July! Instead of making a gift, I decided to buy them something and then decorate the bag they went in. I've done little tiny gift bags like these before, but this time the bags are a bit larger. I figured I would use a pic of the couple on the front and if they want to, they can cut the front off and keep the page. So, it's like two gifts in one. This first bag is for my step sister and her husband. They are both teachers and for their wedding they are getting married in an old school turned restaurant. They also did their engagement photos at a library, so with that I decided to stick with a school themed bag for them. This next one is for a friend of mine and she is very country, so I did my best to match her style for the bag. Hello my cyber peeps! Today I've got a really cool tip using Want2Scrap Stencils, Scrapbook Adhesives by 3L Adhesive Sheets, and Clearsnap Smooch Spritz. I love spritzing on EVERYTHING but it always ends up looking messy with stencils. 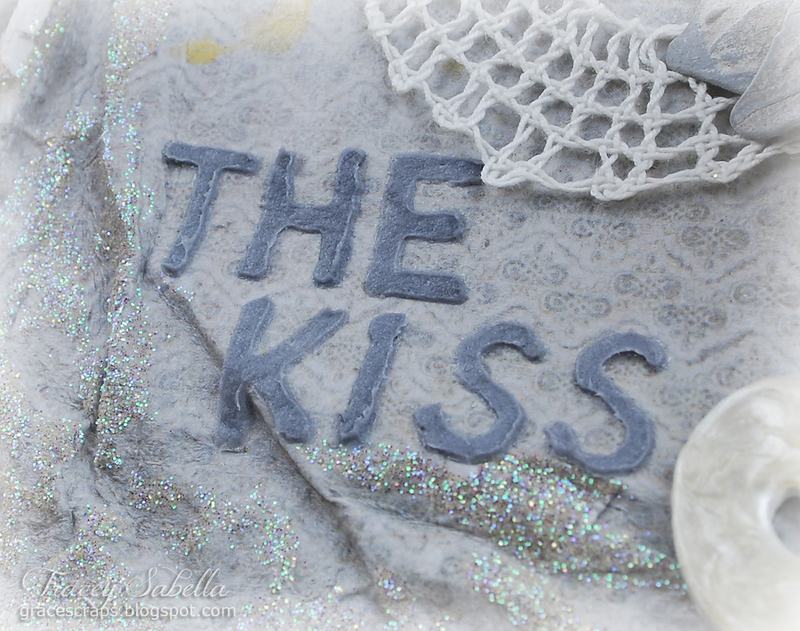 So I came up with an easy peasy technique so that you can use your stencils with Smooch Spritz! By the way... my friends at Clearsnap are trying to get to 10,000 fans before CHA... if you are on Facebook, please like their Facebook page (HERE) and let em know that I sent you over!!! They always have loads of great info on their page so you will definitely be a FAN!!! This is the layout that I made with the finished stenciled denim: "Miscellany In The Brainy"
I did a lot of distressing with the Distrezz-it-All on these papers from the Fun & Funky line and the grid paper from the Basics pad. I added in flowers made from the Fun & Funky and Natural Beauty paper lines that were die cut with my Grand Peonies and Bitty Blossoms Flower Dies. 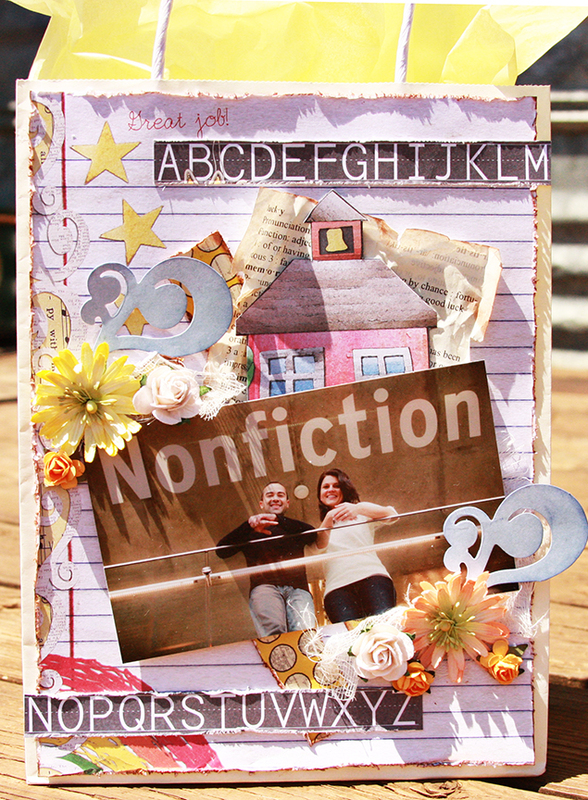 I LOVE using the kraft colored Photo Corners from Scrapbook Adhesives by 3L. I also used a couple Mini Denim Bows from the Blue Gene Baby Etsy shop. 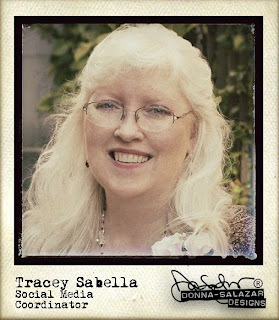 It's Tracey here to share my first project with you as Donna's July Guest Designer. I am so honored to be here with you today and want to thank Donna and Natasha for this amazing opportunity!! This photo of Elizabeth and Andrew sharing a sweet kiss is one of my favorites from their wedding. The Natural Beauty Collection is absolutely perfect to showcase it. 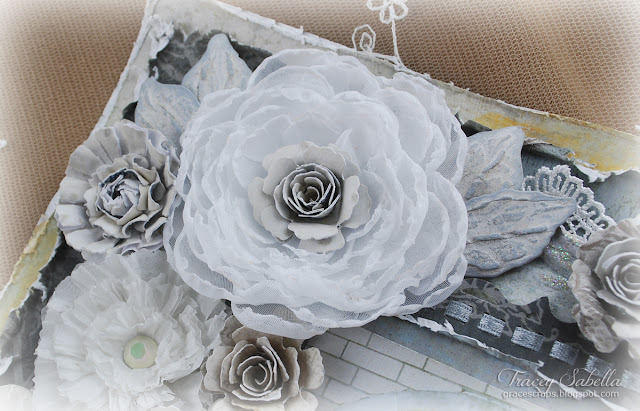 I've included a photo tutorial for my crushed voile peonies. 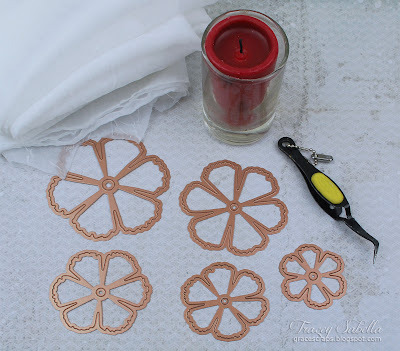 Donna's Spellbinder Flower Dies are my absolute favorites, and I have used Grand Peony, Carnation Creations, and Bitty Blossoms to create these beauties. To bring in accents of gold to the background, I misted and dripped Pralines & Cream Smooch Spritz on the background and border. 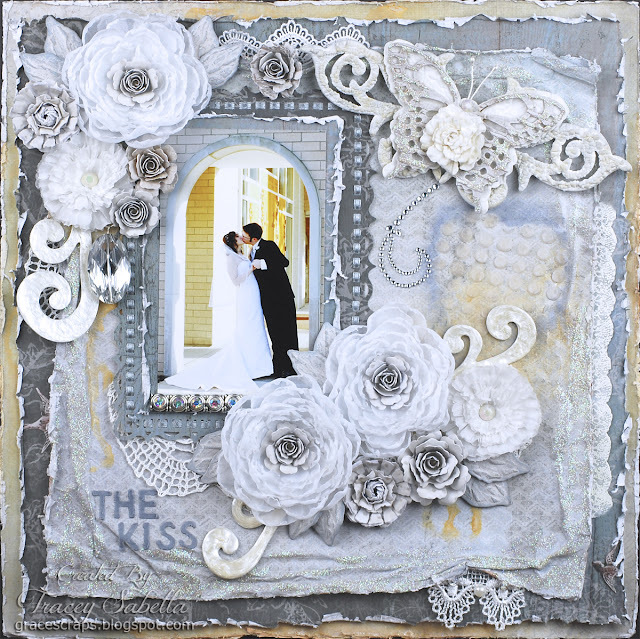 I just adore Donna's new Want2Scrap stencils and used the Polka Dot Heart with blended fiber medium above this cluster. 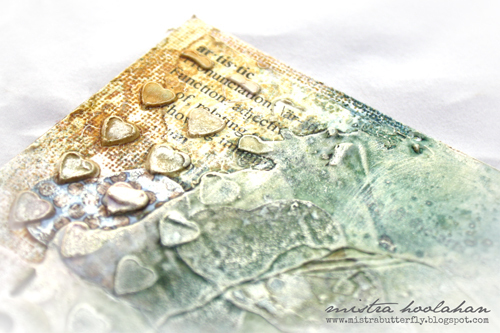 This dotted heart kind of faded into the background so I rubbed Pewter and Denim Mix'd Media Inx softly around the edges. I'm always looking for subtle ways to accent the theme of my photos and this heart was a perfect way to reflect the love shining in this photo. I'm all about girlie grunge, and cut this sweet butterfly from Donna's Want2Scrap Corrugated Board with her Wonderful Wings Spellbinders dies. 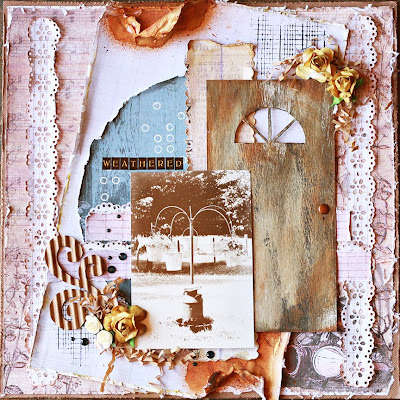 I used Jasmine Mix'd Meda Inx and Fairy Dust Glitter to color and topped with a Bitty Blossoms flower created from Donna's Mulberry Paper from the Mix'd Media Stax 2 collection. I extended the wings with chipboard from Want2Scrap and grunged them up with puffy paint dabbed with Mix'd Media Inx. 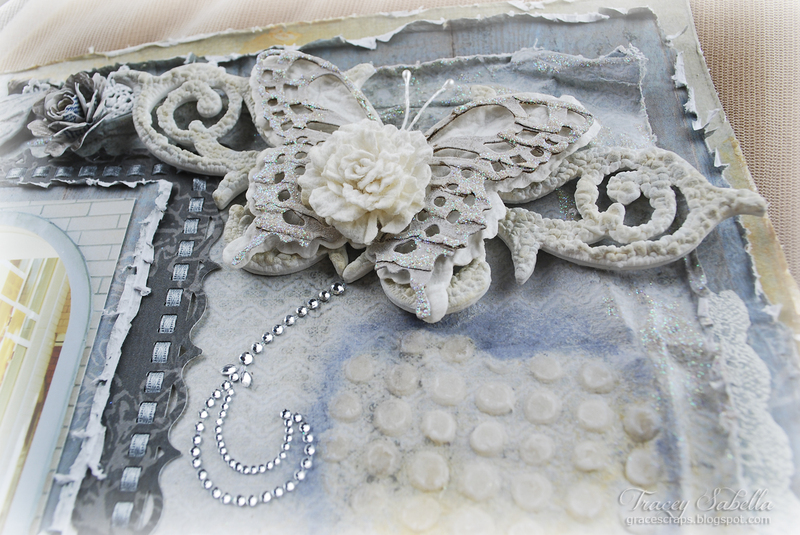 My butterfly trail is a snippet of Donna's Build Your Own Bling by Want2Scrap. There's no easier way to distress edges than with Donna's Distrezz-It-All tool by Zutter. I'd be lost without this handy tool!! Really!! I use it on nearly every project I create. 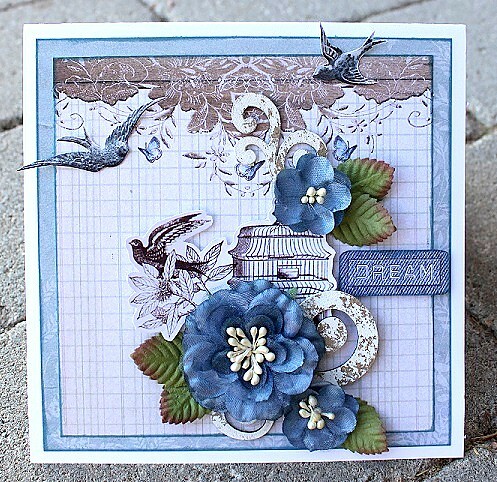 The top cluster includes more handcrafted flowers cut with Donna's amazing dies. 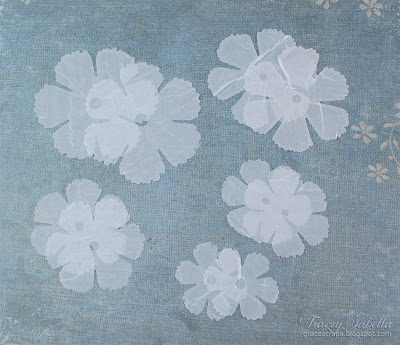 The Bitty Blossoms and smaller carnation are created with Natural Beauty and Family Jeans papers. I tucked in some of Donna's Hand Drawn Swirls chippies. I'll be sharing a tutorial for these grungy, textured leaves later this month. I was inspired by the brick tutorial Lisa Gregory shared last month. I needed some smaller letters for my title, and the letters in Donna's alpha stencil were just right. I used fiber medium colored with Mix'd Media Inx and instead of applying to paper I used a craft mat, creating several sets to have enough letters for my title. Once dry, the letters peeled right off my mat - so easy and I was able to get just the right color and size letters needed for my title. I spread Clearsnap Glue Gloss around the edges of my page and sprinkled with Donna's Fairy Dust Glitter by Clearsnap. These gorgeous peonies take some time, but are really easy to create! Step 1. For each peony, cut two of each size petal. I have found that I can cut up to 4 layers of this thin crushed voile at a time. I make a sandwich to cut them. On your cutting pad, place a scrap of cardstock, then up to 4 layers of fabric trimmed a little large than the die, then the die with the cutting edge facing down. 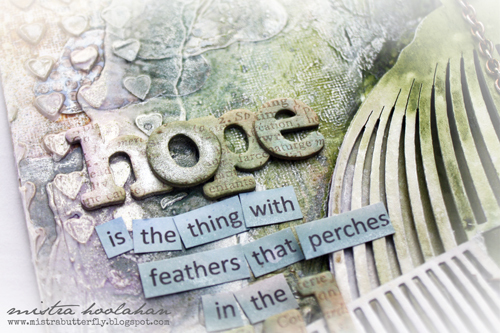 Use whatever cutting plates you would normally use to cut paper and run through your die cutting machine. Depending on how much pressure your machine has, you may have to run it through several times to get a clean cut. Just check to make sure the cardstock is cut all the way through before removing the fabric from the dies. 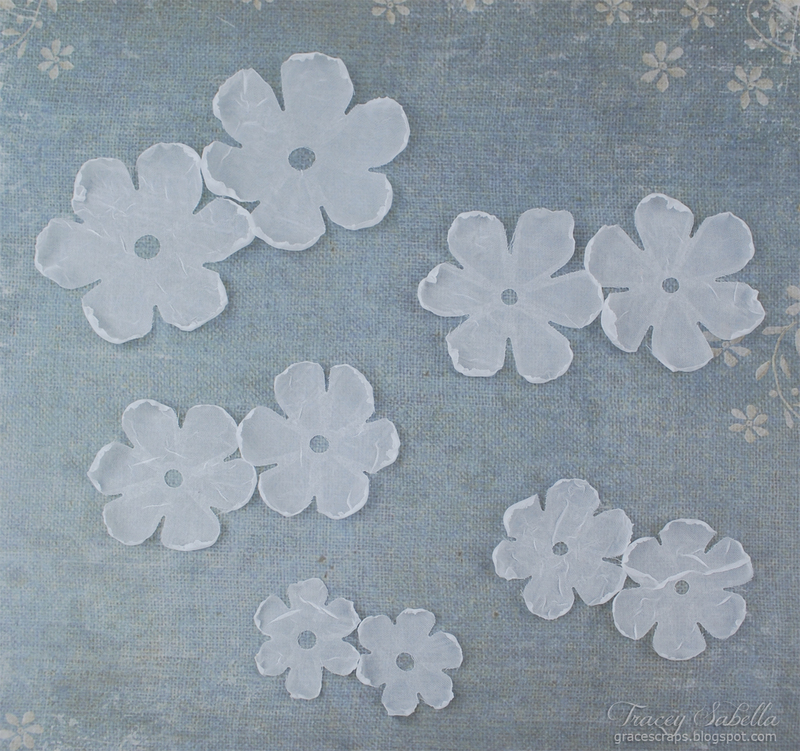 For each whole flower, I cut two each of five different size petal layers. Grand Peony has seven petal dies and I used all but the very largest and smallest. Depending on the size flower you want, you can vary which sizes you cut. You can also use more or fewer layers depending on the look you are going for. 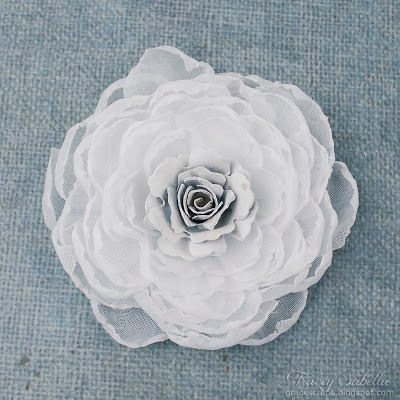 If you don't have Grand Peony, you could create a similar flower using Rose Creations. ***Tip*** It's a good idea to cut a couple extras in case you get a little carried away in the next step. Step 2. Light a tea light or small candle. Hold the petals close to, but not touching the flame, moving each petal across the flame one at a time. 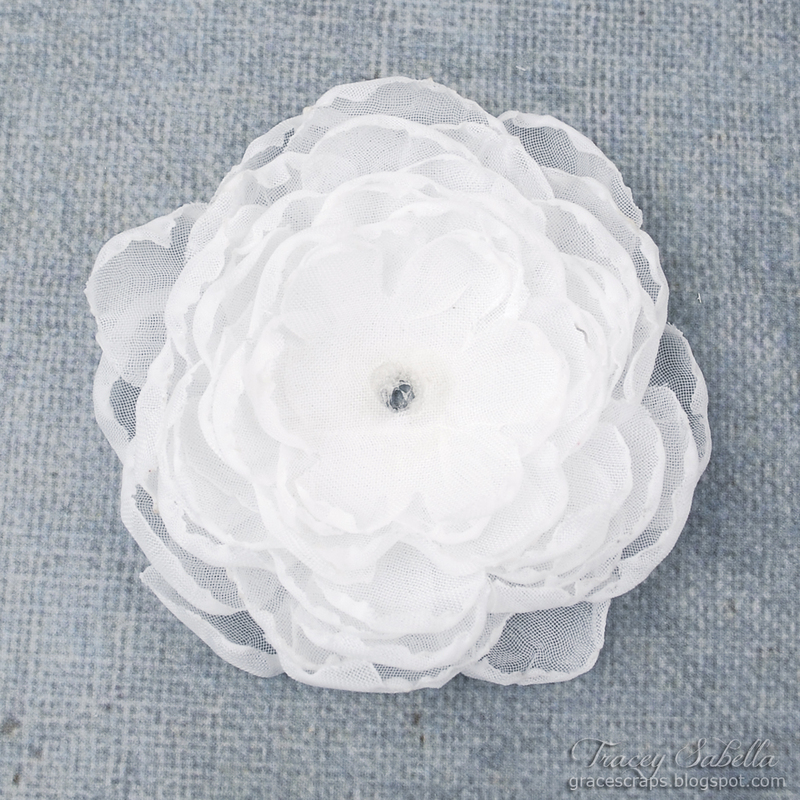 The petals should roll up toward the center of the flower as they melt. You don't want to melt too much, just the edge. 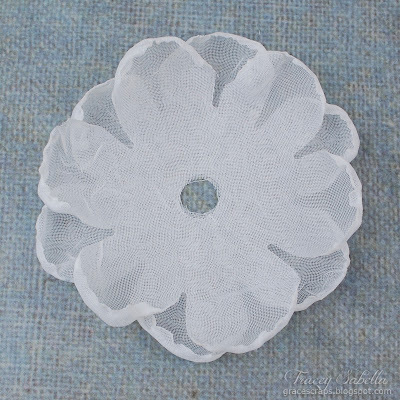 Be sure to have a bowl of water close by so you can quickly dip the petals into water if you accidentally get the fabric too close to the flame. (It's not a project for unsupervised children.) The petals will be uneven and some will end up smaller than others, but that's ok, since in nature, peony flowers have such gorgeous variation in the petal size as well. If you really melt a petal too much, just toss it and grab one of those extras you cut. For the smaller size petals, I use tweezers to hold them. Step 3. Glue the flowers together starting with the largest petals first. 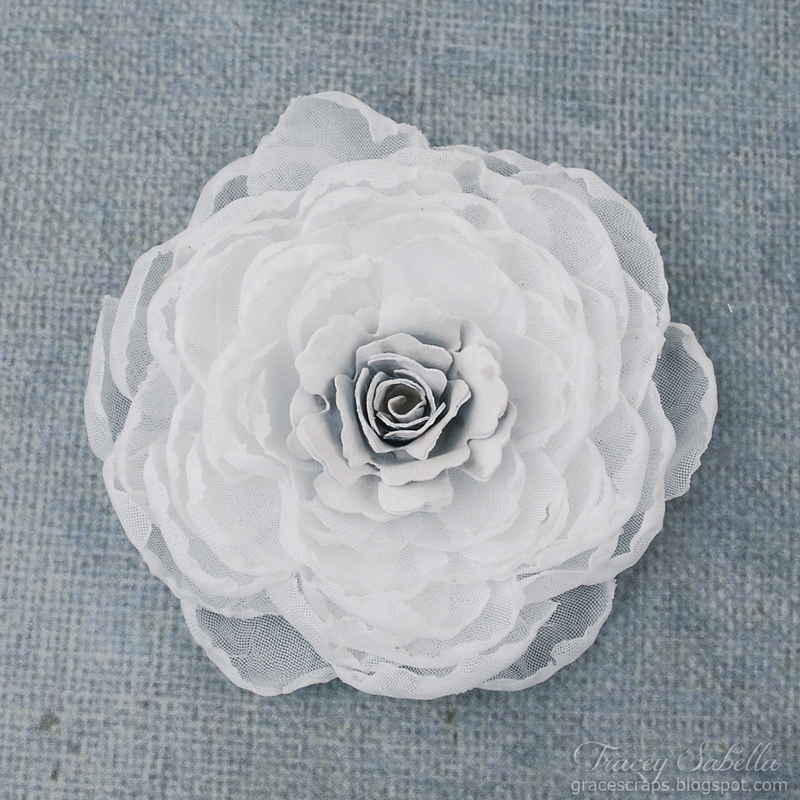 Offset each layer so the petals of the section you are gluing, fall between the petals of the section below it. (As shown below.) I use Beacon Fabri-Tac Glue, but any quick drying liquid scrapbooking adhesive should work as well. Keep on adding layers until you have an entire peony put together. Step 4. Add a Bitty Blossom flower to the center. You could use a variety of things for the center. 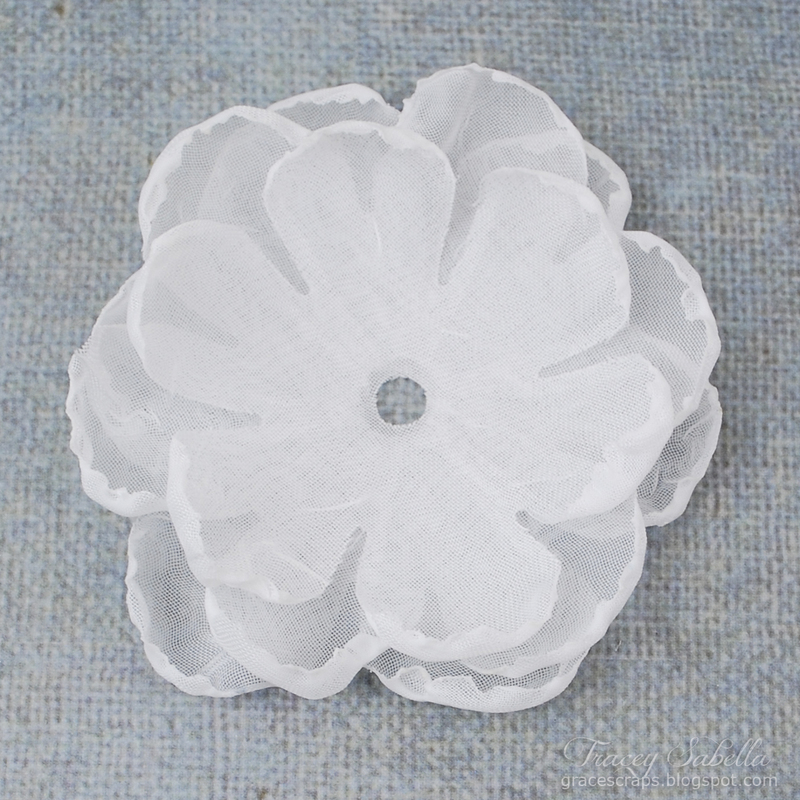 I've used stamen, and you could also use a gem or button. 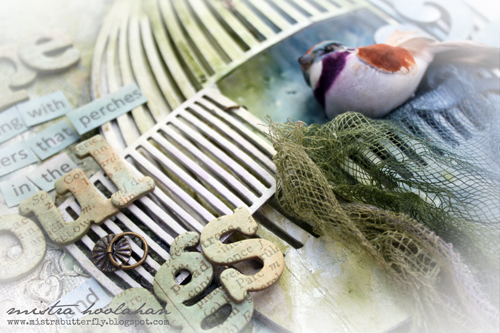 Thanks for stopping by today to view my layout and tutorial. 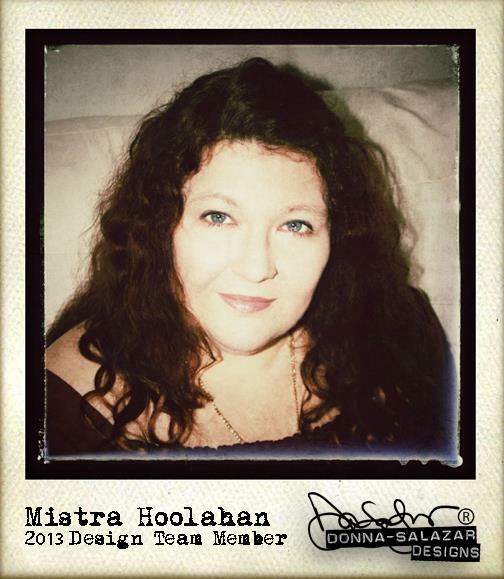 Donna will be posting more of my work throughout the month of July. 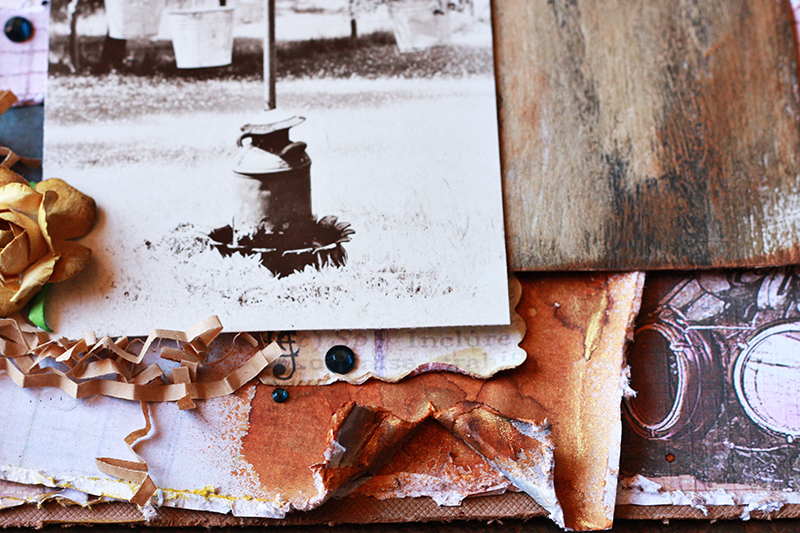 For the back story on my photo, please stop by my blog, Garden of Grace. I have used a Zutter Canvas Artboard as the base, they are fabulously rigid with a MDF backing, perfect for collage and stencilling. I have torn some sections from the dictionary print paper in the Mixed Media Stax 2 and adhered them to the background, as well as some Clouds from the Fun & Funky CutOut Sheet and strips torn from some Natural Beauty papers. The printed quote was coloured using the smooch colours that dripped into the colour catcher, as were the GCD Chipboard Alpha Stickers. 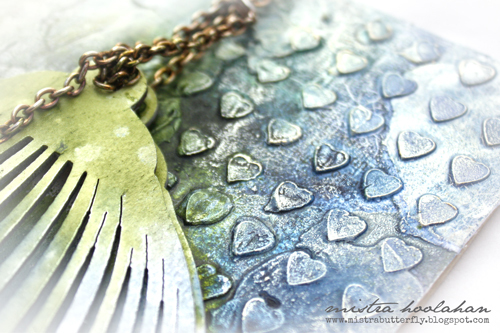 Finally the chain and the little bird embellishment were added and the texture picked up with some metallic rub to finish it off. I love the gorgeous shimmers this shows in the light, with so much colour sprayed onto it, all the mica adds the most beautiful subtle effect! Today is the first weekly (pre-recorded) Tuesday Tutorial Show! I'm no longer going to be doing the live show every other week but now everyone will get a new video every week! And... I'm still going to be giving prizes away... so bonus for everyone!!! 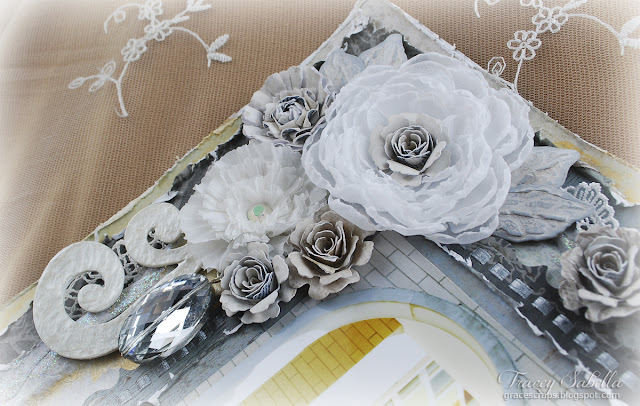 This week I'm playing with the Kanzashi flower maker from Clover, USA. 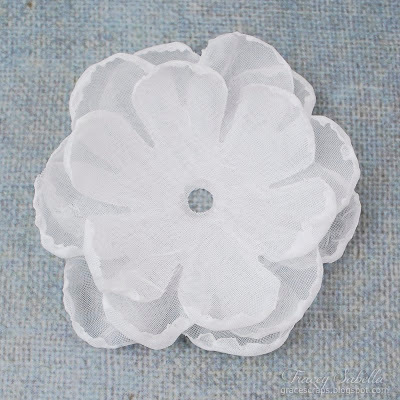 This little tool is designed to make fabric flowers like these... (from the layout I made for Viva Las Vegas Stamps). But I wanted to see if it would work with paper... and it DID!!! 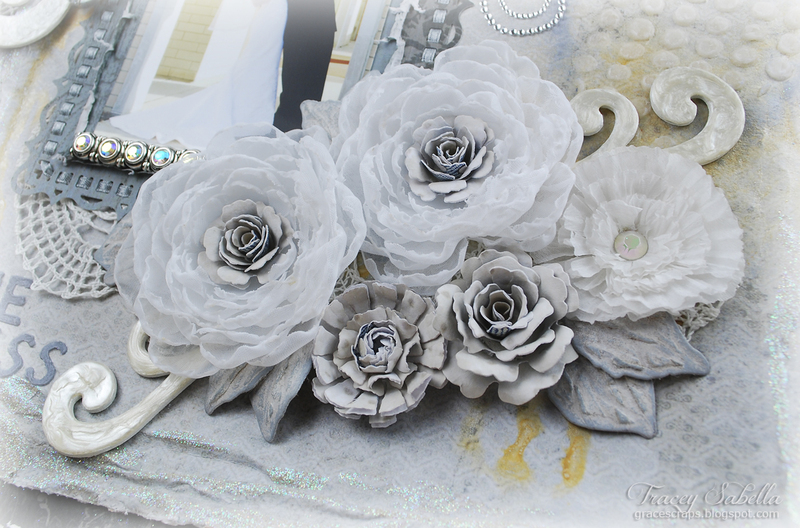 The flowers below were made with the Kanzashi flower maker and my paper from GCD Studios (Mix'd Media Stax 2 & Basics). 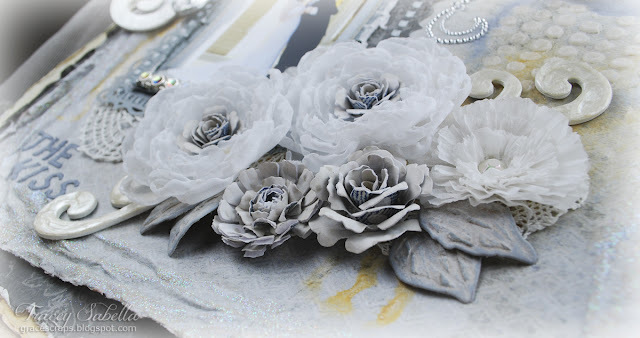 I added them to flowers made with my Bitty Blossoms and Grand Peony Creations dies from Spellbinders. Enter your name into Raffle Copter below to be entered into the drawing for this prize. We will draw the winning name next week but all prizes are shipped out only 1 time a month.